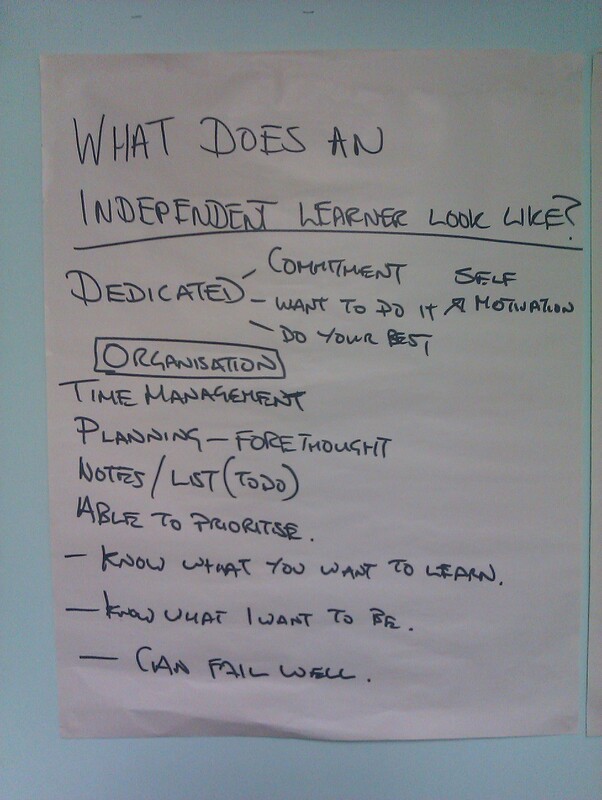 What does an independent learner look like? Yesterday, I asked my Y12 Media students what attirubutes and skills they feel makes an effective independent learner. This is what they came up with; much of which was echoed by those of us who were involved in #ukedchat last night. Does last note at the bottom of the page say “can fail well”? And I am guessing that was the last idea the group came up with (as it is at the bottom of the page). Did you have to eek that point out of the group or did they come up with it, as I find Fear of Failure is a huge obstacle and can contribute to a lot of anxiety around exam times. Actually, that one I added towards the end of the discussion. It prompted a frank exchange about the nature of their learning at GCSE in comparison with the expectations placed on them at A-Level and beyond. Previous Previous post: [#ukedchat] Can we really help our students to become independent learners or are there too many constraints? Next Next post: What is Independent Learning?